Venice, Italy, and its attractions..It's quite hard to list all of them, in this Veneto town, which is considered one of the richest open air museums in the world. If you stay just a few days, it is literally impossible to visit all of it. So I am going to make your day easier, jotting down the absolute must-see things, split into 6 itineraries, so that you can make a choice depending on your available vacation time and on your interests. By the way, bring a map with if you are visiting without a human guide, and mostly if you like exploring the back streets off the main touristic attractions. It’s not that hard to get lost in its maze of about 3000 calli, rio and salizade. No need to introduce the very core of this Veneto ancient town, its cultural and spiritual center, both back in the past and nowadays. Just the vision of the huge square is an attraction in itself. If you arrive to the Tronchetto, the gate of the historical town, you cannot go wrong walking to San Marco Square, as the direction is constantly posted. It is the core of the San Marco Square, and it overlooks its eastern side. It is a unique example of middle ages art and architecture, and this is one of the most impressive buildings of Venice. The basilica takes its name from Mark the Evangelist, whose body was stolen from Alexandria, Egypt, and brought to Venice, becoming the patron of the lagoon city. 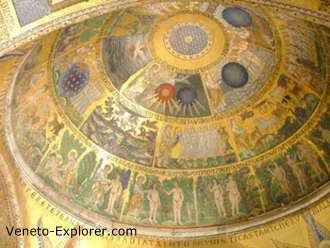 Over the centuries the San Marco Basilica has been filled with gold and priceless work of arts. The facade is a well balanced blending of diverse architectural styles, like the byzantine, the romanesque and the gothic, which mirror the being–between-east-and-west nature of Venice. The high number of round domes found its influence in the eastern style as well. Note the 4 horses placed in the main facade, over the main door. But..they are just a copy. The very ancient original ones, made in gold-plated bronze, based on the carbon-date are estimated to date back to the 3th-4th century BC. They were stolen from Constantinople during the middle ages crusades and placed where the fake ones are now. Since the Seventies they are inside the Basilica museum, to preserve them from time and the elements. You can also go up in the external arcades of the basilica’s facades. Don’t miss the inside, 4000sq.mt /141260sq.ft of breathtaking golden mosaics covering both the walls and domes. Mosaics. San Marco Basilica dome. It’s worth going up to the top of one of the highest bell towers of Italy, to enjoy a stunning view, from almost 100m/280ft height. It was built in the 12th century, and later on renovated around 1500. Un-expectantly, in 1902, the bell tower collapsed. The only victim was the poor cat of the caretaker. Of course it was rebuilt exactly the same. 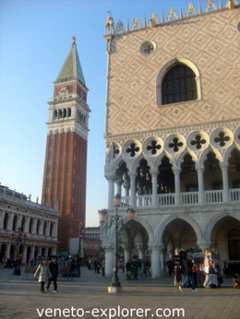 It is in the Piazzetta San Marco, the smaller lateral square of the San Marco square. One of the facades of the Doge Palace overlooks the end of the Grand Canal, with view of the close Isola di San Giorgio (St George Island). It was the palace of the Doge since the 9th century and until the fall of the Venice Republic. At the beginning it was like a castle, protected by 4 towers per corner. Later on, starting from 1300, it became like today. This is another wonderful example of typically venetian middle ages art and architecture, a unique type of gothic architecture, kind of weightless in the bottom part, as if the architectural principles were reversed. It is made of Histria stone and fine marbles. Inside the palace, on the second and third floor, you can visit the Doge’s home, reachable through the majestic Scala d’Oro (Golden Stairs). In some of the lavish rooms you will see paints of renaissance artists of the likes of Hieronymus Bosch, Tiziano Vecellio, Jacopo Tintoretto, Paolo Veronese. If you are keen on old war heirlooms, you might want to take a look at the armory, with a very rich weapons collection, like swords, bows, pikes and so on. Worth seeing is also the refined suit of armour of the famous italian leader of mercenaries Gattamelata (passed away in 1443). At the end of the visit to the Doge’s apartment, you can go for a short visit and take a look to the famous Ponte dei Sospiri (Sighs Bridge), which links the palace to the ancient prisons. If you are keen on ancient greek and roman statues, ancient coins, gemstones and jewels, Etrurian and Mesopotamian items, and stuff like that, you might also want to visit the Museo Archeologico nazionale (National Archeological Museum), the most important in northern Italy as it relates to the ancient statues collections. It is in front of the Doge Palace next to the Biblioteca Marciana (Marciana Library). In the far northern side of the square, besides the basilica, you will see another important symbol of Venice: the Torre dell’orologio (clock tower), built in the end of 1400’s. It is another great example of renaissance art and architecture in this Veneto town. The unmistakable blue enamel and golden dial is 4.5mt/12ft in diameter. So, if you want to have a close look at the clockwork marvel of this renaissance timepiece, you should go for a close visit. Once there, from the tower terraces you will also enjoy a great view to the San Marco Square. It is such a precise and perfect timepiece that in the second half of 1800’s, after 5 centuries of life, it was still used by the city government as a reference to the time setting. The big clock not only displays the time of the day but even the movements of the planets. Of course only those that were known 500 years ago, i.e. Saturn, Jupiter and Mercury. At the top of the tower you will see two bronze statues that were meant to symbolize 2 giants. With time, due to the tarnish of the bronze that made them turn dark, the Venetians started to nickname them the two moors. In fact the clock tower is also known as the Two Moors tower. The two moors are in charge of beating the time with a stick against a big bell. One of them has a beard, unlikely the second one, making them symbolize an old man and a young one. It’s curious the fact that the old man beats the time 5 minutes before the stroke of the hour, to symbolize the past, while the younger one beats the time 5 minutes after, to represent the future. Important to note: the stairway to the tower is very narrow and steep. The entrance is therefore forbidden to persons with reduced mobility, to those with a heart ailment, to claustrophobics, to children under 6 and to pregnant women. Visiting is allowed only by reservation and with a professional guide. Minimun 2 people, maximun 12 people.every day, except December 25th an January 1th. For information on booking a Clock Tower ticket. A Clock Tower ticket gets free admission to the other San Marco Square museums, such as the Museo Correr, the National Archaelogical Museum and the State Rooms of the Biblioteca Marciana.